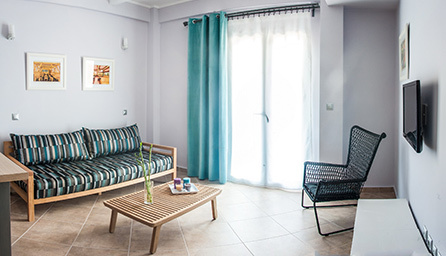 At Villa Despina Green Suites, guests can experience a fusion of tradition and 21st-century comfort and vision. Elaia, Minthi, Melissa, Gerani… Our four beautiful suites designed to fulfill the requirements and the unique personal taste of our various guests. The main idea was the use of decorative elements and materials that are related to the physical characteristics and the cultural history of the greater area as well as the emotions that the area brings on to visitors. 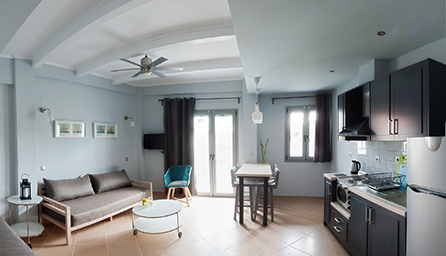 Although all four suites are decorated in discreet, light earth tones with handsome modern furniture, each has its own subtly different layout and character. The building’s pale coral exterior and wrought iron balconies are inspired by the façades of neoclassical Greek architecture. Each suite has a double bedroom, an open plan kitchen/living room with two bed sofas, a bathroom, and balconies at the front and back. The larger front balcony comes with a marble top pedestal table, where one can enjoy drinking coffee and refreshments in the pleasant summer breeze. 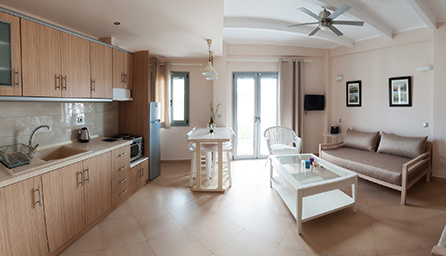 The apartments are self-catering and contain a small stove, hotplates and cooking amenities. They are also furnished with a LCD-LED TV and tablet with an android-operating system. 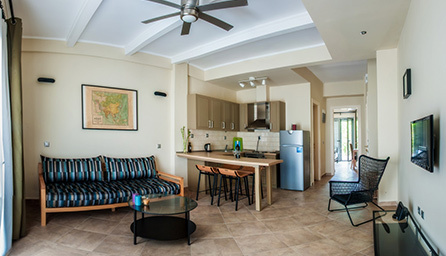 Alongside air conditioning, ceiling fans are available in each room for better ventilation. As part of our green policy, we exclusively use cotton fabrics for our sheets and towels, which are changed upon request. Please, take a more detailed view at our suites’ facilities and features. All apartments lead into a small garden with a gazebo. The assorted greenery and plant beds, the stone-laid patio, and the two loquats trees in this outdoor space make for a cosy, tranquil backdrop where our guests can rest or socialise.